Sometimes Mr. J and I fight. He wants apple pie. I want cookies. Marriage is tough. Our compromise was brownies. Really rich brownies. Mr. J however ended up eating the last three brownies without me knowing. Never a good thing when you go to eat your evening dessert only to find out that no more exists. My advice, if you make these brownies grab them when you can. You never know when they will be gone. I have a favorite recipe that uses cocoa powder but I truly feel a good brownie comes from melting a hunk of chocolate. This recipe does just that. Preheat the oven to 350F. Butter and lightly flour a 13x9 baking pan. Melt the chocolate and butter in the top of a double boiler over simmering water. Let cool in the pan to room temp. Pour the batter into the prepared pan and smooth the top. Bake 25 to 30 minutes. Let cool in the pan completely before cutting. Mmm. :) Your Mr. sounds a lot like mine. Definitely not to be trusted around the last few pieces of the dessert! omg yummmyyyyy love the rich, fudginess! 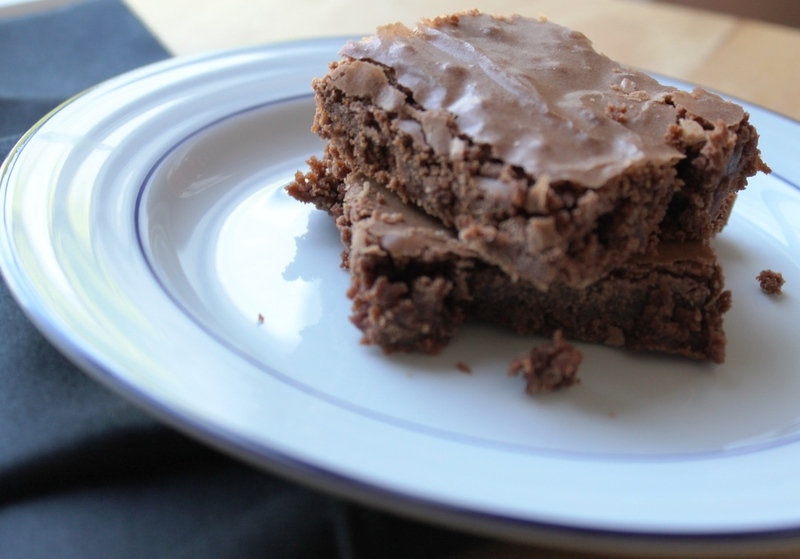 Rich brownies to die for. And what's with the apple requests? My Mr J always asks for apple crisp and we always settle on cupcakes lol! ahhh. Marriage is tough! I think it's in the husband rule book to eat down the sweets when we have a craving for them. Our food fights are usually about shrimp or ice cream. This may give us a third, but I'm going to try it anyway because it sounds SOOOO good. Oh there is nothing worse than realizing your dessert is gone! (Especially when it's too late to make another batch!) But I'm glad you guys were able to reach a compromise. I can certainly see why! These look delicious.